Richard Mooney, the George Barth Geller Professor of Neurobiology at Duke University, and a leader in birdsong neuroscience sat down recently with our very own Vania Cao for an interview while he was attending our DECODE Summit as a DECODE awardee. You can read the full interview below, or watch a video snippet. VC: How did you get interested in neuroscience? RM: I got into neuroscience through an interest in music which triggered an interest in audition and auditory processing, and evolved into an interest in how auditory and motor systems interact, and that has many, many flavors. I started out as a graduate student studying birdsong learning and mechanisms for interplay between auditory and motor systems to guide vocal learning, and that includes auditory memory, and rapid sensory motor integration for vocal learning, extended to vocal communication and vocal perception, vocal production and more recently has morphed into an interest in how motor systems influence auditory processing through what are called corollary discharge signals in the brain. Those interests are broad at this point, and really have been aided and abetted by a wide range of technologies. The Inscopix technology has been a real boon for what we’re doing particularly in birdsong. VC: What is the specific research topic of interest for the DECODE award? RM: The focus of the award was to image basal ganglia activity in vocalizing animals, and to understand how social cues in the context of courtship behaviors in songbirds modulate basal ganglia activity, and subsequently how those cues transform motor-related activity in the basal ganglia that very subtly but importantly modulate variability in the vocal performance of the male to the female. That was the initial aim, and then it was to extend it into a disease analysis. We’ve used viral gene transfer methods to knock down or manipulate expression of genes that are associated with human neurological disorders, including Huntington’s Disease and an orofacial dyspraxia that’s triggered by a mutation of a very now famous gene known as FoxP2. We’ve characterized this quite a bit both at physiological and behavioral levels now, and we’re just on the verge of applying Inscopix technology to image basal ganglia activity with the expression of disease-related effects in the basal ganglia circuit, and the consequent effects on behavior. VC: What aspects of using the nVista system are going to help with these types of research questions? RM: I think the most important thing to get out there right at the outset is that one of the advantages I see, after having spent almost my entire career using high-resolution single-cell recording techniques and cellular recording techniques primarily in reduced preparations like brain slices in anesthetized animals and more recently in freely behaving animals, is that the technology gives you a potentially unbiased screen of neural activity. There are many cell types that are difficult to access with electrical methods. You just can’t see them because they’re too small or rare to be readily picked up with an electrode. But with shotgun viral methods to express reporters like GCaMPs widely in a population of neurons and then a wide field imaging method that Inscopix provides, you can get a sample that may be harder to see electrically. It’s almost like the forest and trees effect, I think with some electrophysiological methods. The trade-off, of course, is that you don’t have the really detailed high spatial resolution, very fine temporal resolution that electrophysiological methods can afford. But if you use these methods in a complementary fashion then that’s very very powerful. And we’re really seeing that in a lot of our work now. We have a paper submitted that basically leverages the power to sample rare neuron types in birdsong. We’ve been able to sample a cell type that we identified and characterized its role in singing, and in conveying a motor related signal into the auditory system. I don’t think we could have done that with electrophysiological methods. VC: Why do you feel that neural circuits are important to study? RM: I think I was a pretty early proponent of circuit analysis. Part of the answer is because we can now. We really couldn’t in a very meaningful way until I would say the last decade. Of course, the really amazing properties of the nervous system aren’t credited entirely to the nervous system. There are organismal aspects to perception, cognition, behavior, learning, memory, affect - those are higher order processes, and I think attributing them entirely to the brain or probably more inaccurately to a single circuit is an error. However, those properties must emerge from the interaction of large populations of neurons that are connected via specific sets of synapses in the brain to enable the kinds of computations that give rise to those higher order processes. So, that’s a long-winded way of saying that the circuit is the stepping stone from an elementary unit of the nervous system, the cell or even a subcellular structure like the synapse to a computational unit that actually starts to do something impressive. It really makes the brain more than say a single-celled phototaxic algae. The brain does things like predict the future, predict consequences and movement, enable very complicated social interactions that are essential to being human and also are the qualities of the human mind that are most sensitive to certain genetic insults, like when we think of autism spectrum disorders or certain psychiatric disorders. These are in a sense very subtle disruptions of brain circuitry but have very profound consequences. The second part of the answer is that from a disease standpoint, an emerging picture is that there are degenerative diseases of the nervous system, and Alzheimer’s disease is a good example of that - tauopathies - where the damage is initially quite focal but propagates through the brain along highways that are provided by neural circuits. So, in that sense, identifying and understanding those neural circuits will probably become an important aspect of therapeutic intervention to prevent the explosive destruction of these neurodegenerative diseases. VC: In the next five to ten years, do you have any thoughts on what the field might be discovering or what contributions do you feel like neural circuit understanding will give to how we think about the brain? RM: I think what’s happened now is that there’s been an integration of different types of monitoring methods – calcium imaging being a good example, and multielectrode array recordings being another – and genetic tools like DREADS, and of course very rapid modulation of neural activity with opsins of various kinds. In total, that’s a complete game changer for doing something that I think was impractical until those techniques could be integrated. They get at a systematic causal linkage between neural circuit properties and activity, and very important aspects of brain function, things like perceptual processing, learning, memory, fine motor control, sensory integration. That’s where I see it going. I think we’re already there, frankly. We’re right in the midst of it. I feel really lucky to have been developing my career over when those tools became more and more available, and allowed us to start to interrogate in real time brain function in the context of natural behaviors. That I think was a pipe dream twenty years ago. It started to become something people thought ten years ago, “well wouldn’t it be great.” And now it’s an everyday aspect of neuroscience research. So I don’t know that we have to wait five or ten years. At the stage of career I’m at, I’m not inclined to wait five or ten years! I have a good group and we’re trying to do it right now, which I think a lot of people are. VC: What challenges do you see to being able to make insights into understanding these more conceptual functions that the brain can do? RM: I have a little bit different view of the problem from a lot of neuroscientists because I don’t work exclusively in a genetically tractable organism. We do work in mouse, and we avail ourselves of the genetic tools that are very powerful. The challenge I see is transferring these various technologies that I just described, imaging and optogenetics and other genetic manipulations, to non-classical species, to animals that are specialists for doing very specific behaviors, and I would say in that sense, unlike the mouse, who’s a generalist, which in many ways is not like us. It’s nocturnal. The social structure in mice is very different from human social structure, I think, and they’re not particularly visual animals. 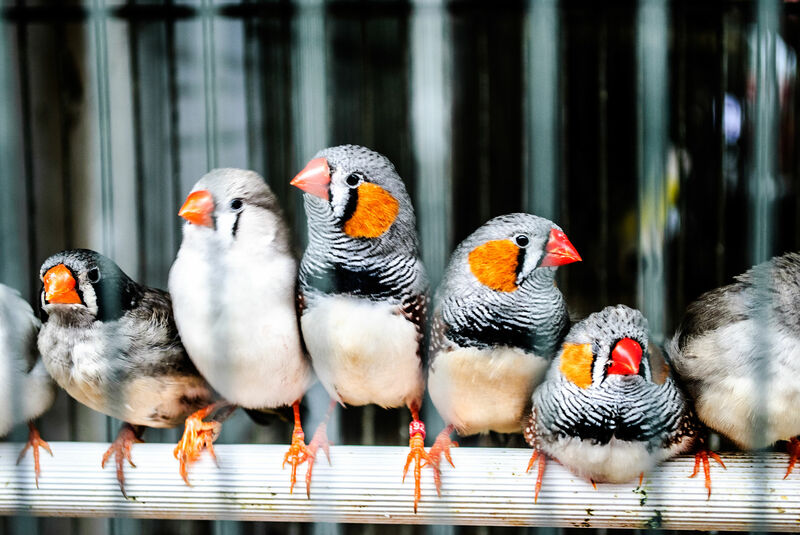 Using those methods in animals, songbirds is a good example. It’s highly specialized for vocal learning. And in the course of trying to understand that vocal learning process, I think the field has gained huge insights into a variety of issues that are relevant to human biology, including sensory motor integration, very rapid motor control, respiratory vocal integration, the role of basal ganglia in the control of sequential movements, the formation of auditory memory, the interplay of motor and auditory systems for communication. I think these things haven’t been well understood in any other system. What I see as the challenge is application or adaptation of the variety of methods that are so powerful. Genetic tools, and imaging, and the like, in a system such as the bird. It could be any number of animals, such as the electric fish, barn owls, or even various insects, where the link between neural activity and behavior is much clearer than it often is in the traditional rodent models. I think that’s going to be the big challenge. We’ve been a part of that. There are other groups that have really helped spearhead that. I think CRISPR technology is going to be important because of the ability to do site-directed genetic knockouts. That will be very useful in these non traditional species. Viral technologies could be better adapted and refined for use in these other animals. I think that would be a big part of it, in the near term. VC: What do you find exciting about being a neuroscientist today? RM: What don’t I find exciting about being a neuroscientist today? I think this is the very best time to be doing neuroscience research, partly because of the convergence of tools, the growth of the field, it’s very mature. We can do things we could only dream of doing even a few years ago. Now it’s almost as fast as you can work you can make progress, not necessarily resulting in a publication a week, but I do feel a momentum that’s really encouraging. The other aspect that I’m very excited about is...of course everyone is interested in neurological disease, especially as we get older it becomes a more and more salient aspect of our experience. And it’s a huge cost to society. Understanding how neural circuits function in health is a prerequisite to understanding what goes wrong in disease. The ability to use genetic tools to manipulate disease-related genes in various organisms, non-human species, I think is also something to be tremendously excited about. It will prove very useful. I mean, when people ask me questions like this, I tell them the story about my grandfather who was a mechanical engineer. He worked on locomotive air brakes. He was a very good engineer who lived in Pittsburgh, PA, and just as I was starting graduate school, he was still alive. He died a year or two after I started graduate school. He asked me then because I was starting to study songbirds, and he said, “what are we ever going to learn by studying songbirds? How is that ever going to be relevant to human health?” And if he were alive today I’d say, “tremendously!” We’ve been able to use the songbird system, and the incredible stereotype sequential vocal behavior in those animals to probe the behavioral consequences of expressing disease-related genes in the basal ganglia. So I think that aspect of neuroscience has me very excited!